I am very excited to bring you the first of several (hoping many) posts about brewing beer on production scale systems. That’s right; I convinced several local breweries to let me peek behind the curtain and be an assistant brewer on a batch of beer. The goal here is to be present from start to finish for a single batch of beer — a “grain to glass” approach to beer. Think of these posts as high resolution brewery / beer tours. The goal of these posts is to showcase the process of brewing, pointing out unique procedures, ingredients, or equipment that each brewery employs. I hope people find them entertaining and informative. These posts will have a series of photos and videos that show the work flow of the brewery and the final product. The first place that let me tag along was DC Brau Brewing Company. In case you don’t know, DC Brau is about 3 years old, opening in April 2011. It is the first package / production brewery within the District in more than 60 years. Since they opened, a few other places have opened up but they were first. DC Brau has many feathers in its cap for several beers, most recently having their canned double IPA “On the Wings of Armageddon” named one of 10 best canned brews in the US by Phoenix New Times. DC Brau is definitely a brewery on the grow; shortly after my brew day there in mid-April they announced that they were going to install 6 more fermentation tanks to almost double their capacity (again!). In fact, last year in a great piece by “The New Yorker“, DC Brau was the 5th fastest growing brewery in the country — and they’ve continued to expand since that article. Their beer is brewed in their 15 barrel brewhouse (pictured below). They currently package 7 different varieties of beer in 12 ounce cans and have several more that they keg. DC Brau also has a small barrel aging program that has produced several wonderful beers, my favorite barrel aged beer from them being the Maple Barrel Aged Stone of Arboath (a Wee Heavy). Their “flagship beers” are the three they launched with back in 2011: Public, Corruption, and Citizen. Public is an American Pale Ale (more on that later), Corruption is an IPA and Citizen is a Belgian Pale Ale. As they’ve grown, they started canning El Hefe (a hefeweizen), Penn Quarter Porter, On the Wings of Armageddon (DIPA), and The Tradition (a golden ale brewed for DC United). Those are the 7 beers you can expect to find from DC Brau if you visit the brewery or pop into a liquor store around DC. DC Brau’s 15 bbl brewhouse. (Left to right) Hot liquid tank, mash tun, control panel, brew kettle. So, what did we brew? Batch #190 (60 bbl total) of The Public. My personal thoughts on The Public as an American Pale is that it is a good beer. It is an east coast interpretation of a hoppy American ale. It is amber with a strong malt presence blended with grapefruit hoppiness. It is the first beer I ever had from them (at their launch April 15th, 2011, at Meridian Pint), and one of their most popular beers. It currently has an 87 out of 100 on beeradvocate.com, a good score for an APA. This isn’t DC Brau’s hoppiest offering (they have “The Corruption” and “On the Wings of Armageddon” as their IPA offerings — “Wings” is great if you haven’t had it) but it is a wonderfully solid American Pale offering, by far the best in the DC-MD-VA area, in my opinion. Unlike the homebrew posts, I will not be posting the recipe for the beer on here but rather I will give some insights into the recipe and the process they use. The brewhouse at DC Brau is 15 bbls and the batch of Public being made that day was (targeted at) 60 bbl so that means 4 back-to-back brews happened that day. I was present for brew #2 and brew #3 (and the start of #4) but completely missed brew #1 since it started at 5 AM. The only consequence for this story to missing the first brew of the day is that I missed the pitching of the yeast. I took several photos and videos while working at the brewery for the brew day and then I returned a few weeks later for the canning of this batch. The workflow at the brewery is both similar and wildly different than brewing at home. Perhaps that goes without saying; the process is conserved but the scale at which it takes place is mind-blowing, to me at least. A 15 bbl batch of beer requires about 1,000 pounds of grain. 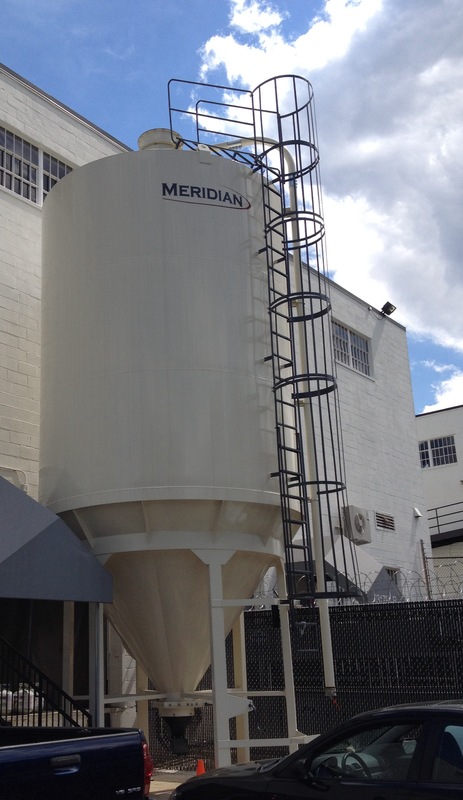 One of the big upgrades DC Brau has undergone in recent months is the addition of a huge grain silo on the outside of their brewery. 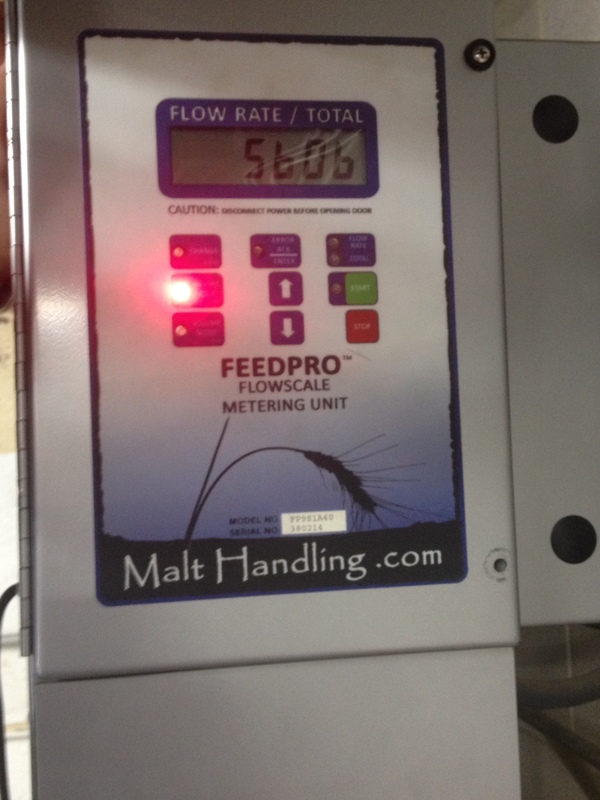 The base malt for the beers is now pumped into the brewery directly into the mill. I added 200 pounds of specialty malts (Vienna and a caramel malt) to the grain mill to get the color and FG desired for the beer. There is a poor-quality video of grain crushing below (it was dark in there) and a photo of the control panel to the pump that transferred the grain from the silo outside to the mill. Control panel to pump the grain out of the silo into the mill. 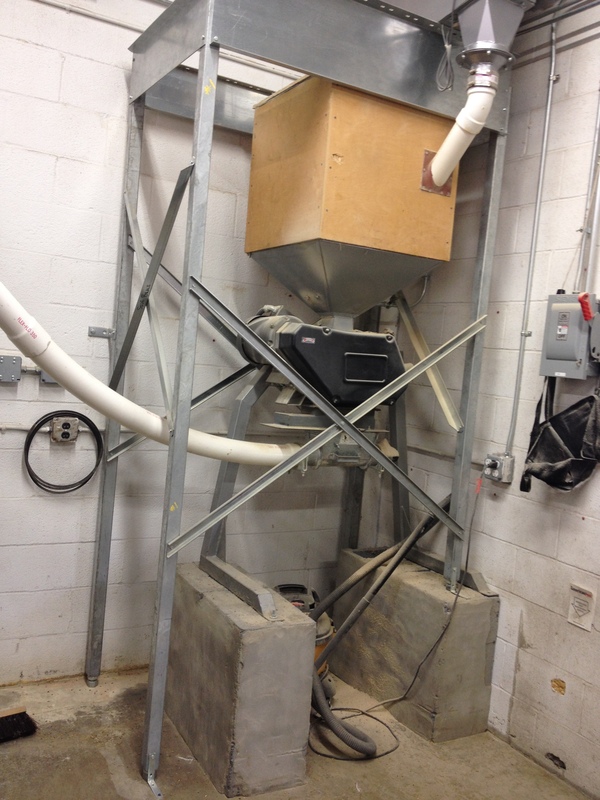 Grain mill that crushes the grain before the mash. 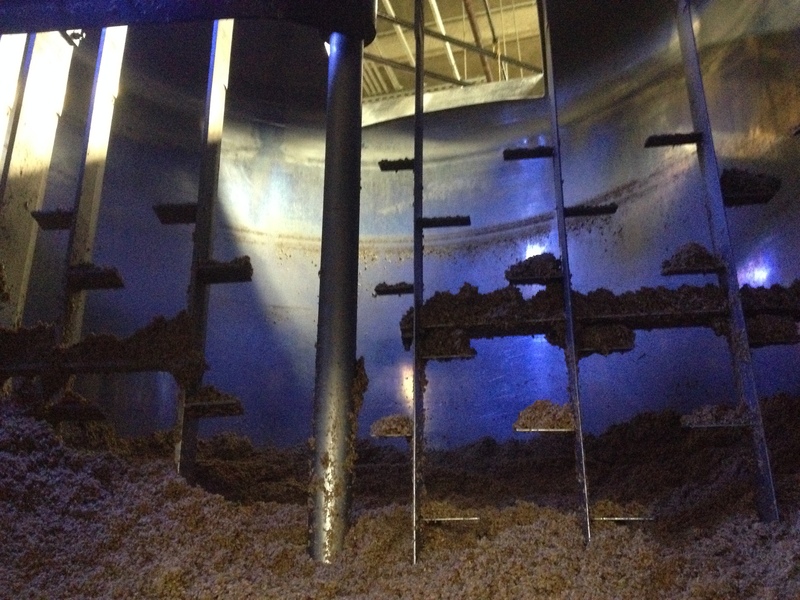 Once the grain was crushed, it was transferred to the mash tun for the mashing portion of the brew. This is achieved through a system of pumps and pipes that mix the grain with water at a pretty steady rate and drops the mixture into the mash tun through a hole in the top of the mash tun. About 1,000 pounds of grain and about 430 gallons of water went into the mash tun. While the grain was being added, the rakes rotated to help mix the grain and evenly distribute the heat throughout the mash tun. Several temperature readings of the mash were taken by Chris (the brewer) and myself — and there were hot spots and colder spots but overall the mash temp was right around 149 F. The grain was mashed for about 40 minutes. Grain and water delivery to the mash tun. 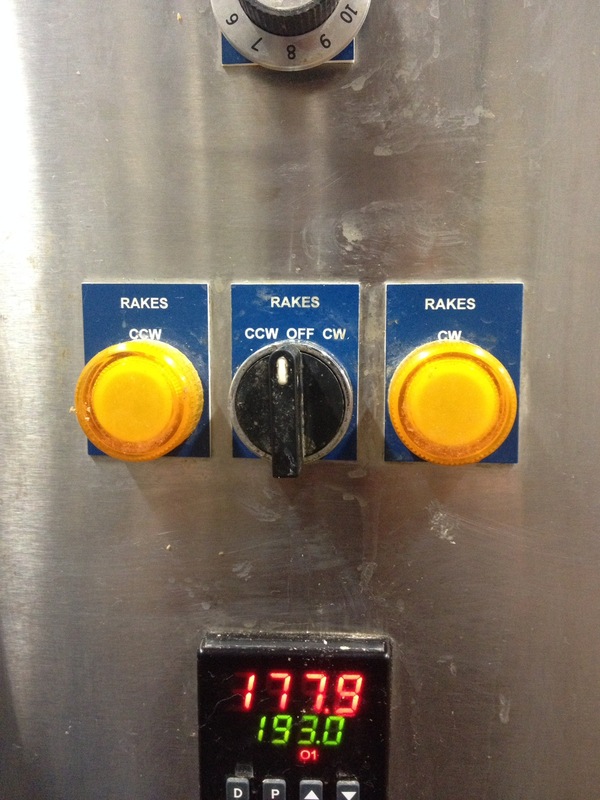 Control box for the rakes, clockwise for mash-in, counterclockwise for grain-out. The mash tun has a stainless steel false bottom, with thousands of tiny holes in it. After 40 minutes, the mash tun was drained via a lauter tank and pump (described below in the sparge section) into the kettle. This process took a while. 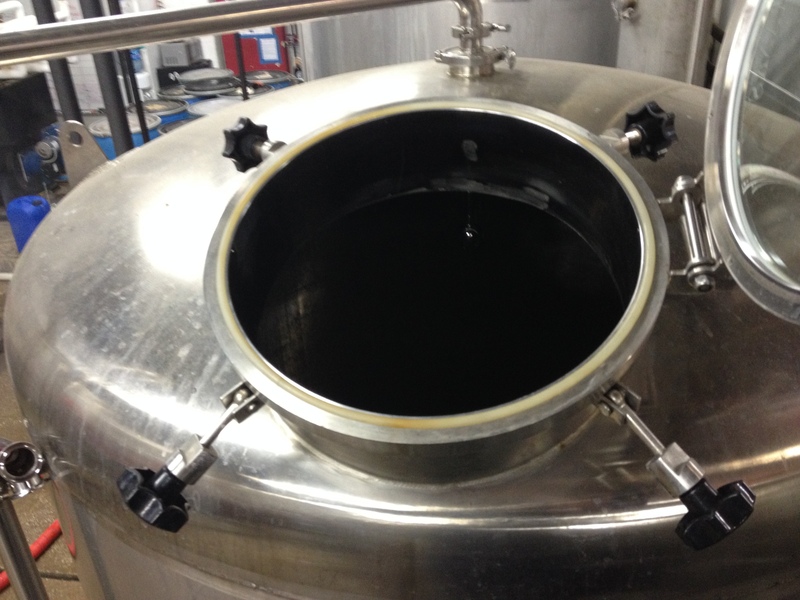 While the wort pumped over, the kettle was warmed up using the steam. It took a while to get the kettle warmed up; this was the slowest part of the day, waiting for the mash to drain. After the wort was recovered from the mash, the sparge was started. Sparging is basically washing the grains in the mash tun with hot water to get the residual sugars and wort out of the bed. This was achieved through the same water valve on the top of the mash tun and some pipes inside that sprayed the water all over the top of the grain bed. The grain bed was sparged with about 250 gallons of water. The rate of sparging (a homebrewer would call it “fly sparging”) was kept at a rate where the grain bed would be just under the water level. During the sparge, the wort was transferred from the mash tun to the kettle by allowing it to gravity drain into a small lauter tank. The lauter tank can be seen at 0:55 in the video below. It is about a 5 gallon-ish metal tank that fills with the wort and when it reaches the float sensor, the lauter pump drains the tank over to the kettle. This was the same way the wort from the mash was transferred in the previous step. Combining the run off from the mash and the sparge, about 17.5 bbl was collected into the kettle. The target for each of these batches is 15 bbl so about 2.5 bbl will be lost in the boil. This beer was boiled for 90 minutes. The boil was uneventful. The joke about working in a brewery being all about cleaning is basically true from what I could see. We were constantly cleaning while we went through the process. “Grain out” was the process of emptying the mash tun after the sparge was over. The rakes in the mash tun were turned back on in the counterclockwise direction. A squeegee sort of paddle was lowered via a chain and pulley. The paddle helped push the grain out toward the edge of the mash tun. There is a door on the side of the tank at the bottom where all the grain falls out. The grain was emptied into several 60 gallon barrels for use by local farms (unless the FDA thinks of a reason why that’s a bad idea). After all the grain was removed from the mash tun, the whole tank was hosed down to get it pretty clean. Since there was another batch of crushed grain waiting to go into the tank and it was the same beer, it wasn’t washed with caustic or anything like that. Water was sufficient for this intermediate batch. AfterSo, anyone who has brewed a beer before knows that early hop additions give a beer bitterness, later hop additions are more on the flavor / aroma side of things. This beer had several hop additions in both a kettle and a whirl pool (pictured below). The video is of me pouring in one of the kettle hop additions. The kettle additions (exposed to boiling wort) are going to contribute more bitterness to the beer and less flavor and aroma. Aficionados can pick out which hops (or at least get close) were used in bittering additions but most people can’t. I like to think I can but I’m likely fooling myself there. For this particular beer, there were a lot of hops added in the whirlpool, a relatively specialized piece of equipment that not all breweries have. A whirlpool is another tank downstream from the kettle. When the boil was over (after 90 minutes) and the target volume of 15 bbls was reached, the near boiling wort was transferred via a pump and hose to the whirlpool tank. In this tank, a bunch of hops were dumped in and allowed contact with the hot wort for about 30 minutes. Watching the whirlpool fill was pretty cool but I couldn’t get any film, there was too much steam and the hatch had to be kept closed. Since these hops are never in contact with boiling wort, they will add to the flavor and aroma primarily. In addition to this late hop addition, the Public is also dry hopped in the fermentation tank…dry hopping is all about aroma. Once the beer leaves the whirlpool, it is pumped through a plate chiller and oxygenated during transfer to the fermenter. 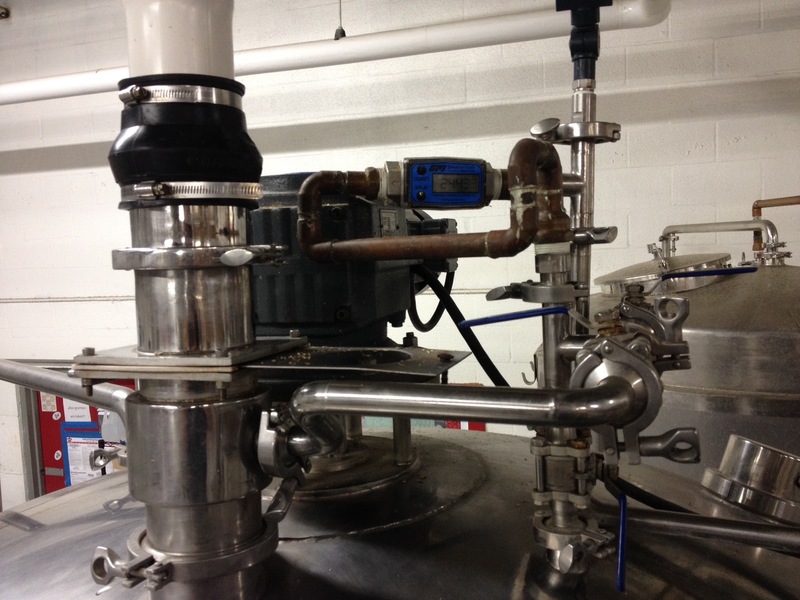 This is the critical step in the beer making process because this is the transition to a sanitized environment. You don’t have to worry about infecting the wort when it is boiling. Now, you can ruin the beer. I was joking earlier about emptying the mash tun and cleaning everything as we went….this is where we thoroughly cleaned everything with caustic, isopropanol, and hot water…the hoses and pumps were flushed with cleaners and then high temperature water (to sterilize the lines and wash out residual cleaning solution). 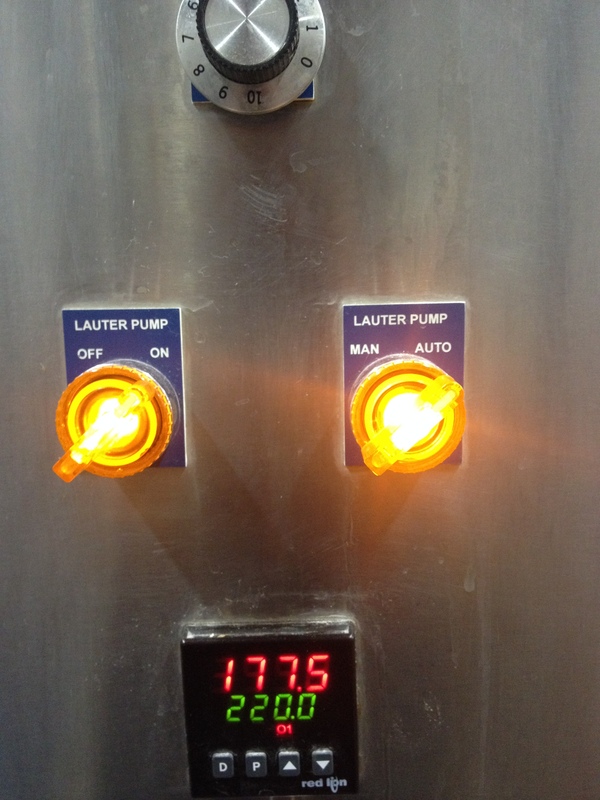 Once the beer was in the line, oxygen was added from the tank (pictured below) directly inline with the wort pumping out of the chiller, through the line, into the fermentation tank. The oxygen was allowed to be inline with the beer for several minutes (not during the entire transfer which took a while). This video follows the beer as it is leaving the whirlpool, it goes through a red hose to a pump, into the plate chiller (0:20), out of the chiller inline with the oxygen (0:29), through a line (gray line) all the way to the fermenter (60 bbl fermenter). You can see at 0:06, the liquid in the glass tube is all wort but after the oxygenation step it is a mixture of gas and air. 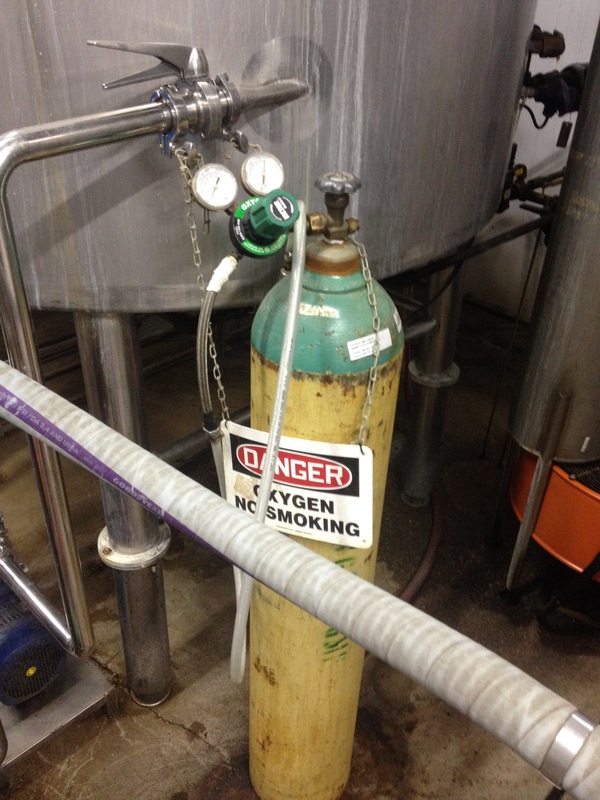 The oxygen will give the yeast a boost of energy in the beginning of the fermentation to let them get started. They will consume the oxygen in a matter of hours. The bubbling in the blue barrel is just the air in the tank being displaced by the wort being added from the bottom valve. Now that the fermenter is filled, the yeast do the work. Brewer’s make wort, yeast make beer. Due to a scheduling conflict and a miscommunication (my fault), I was not present for the dry hopping or transferring of this beer out of the fermenter into the bright tank. I’ll get the next one. After being dry hopped and transferring into a bright tank, the beer is ready to be packaged. 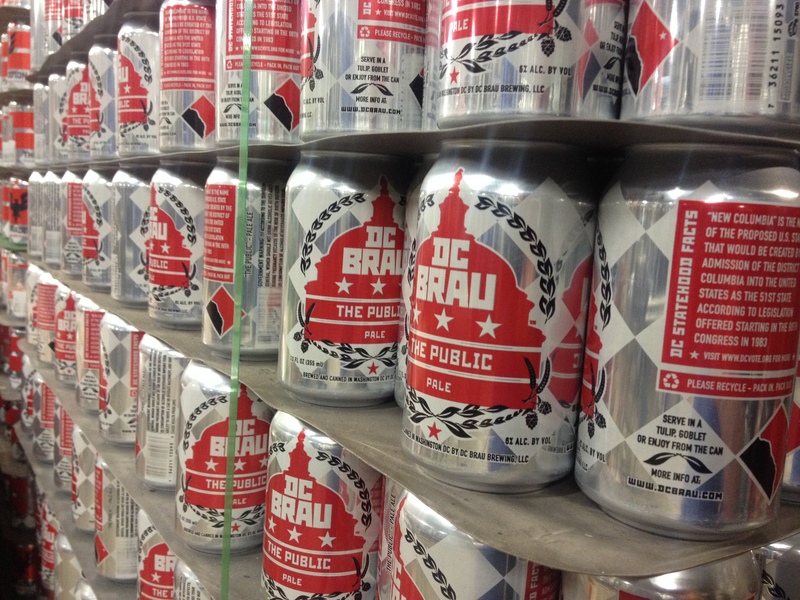 One of DC Brau’s signatures is the iconic can. As mentioned earlier, they can 7 different varieties of beer but the three “flagship” beers from the beginning are Public (pale ale), Corruption (IPA), and Citizen (Belgian Pale ale). Each of those display prominently the DC Brau capitol building dome logo, each with their own color. 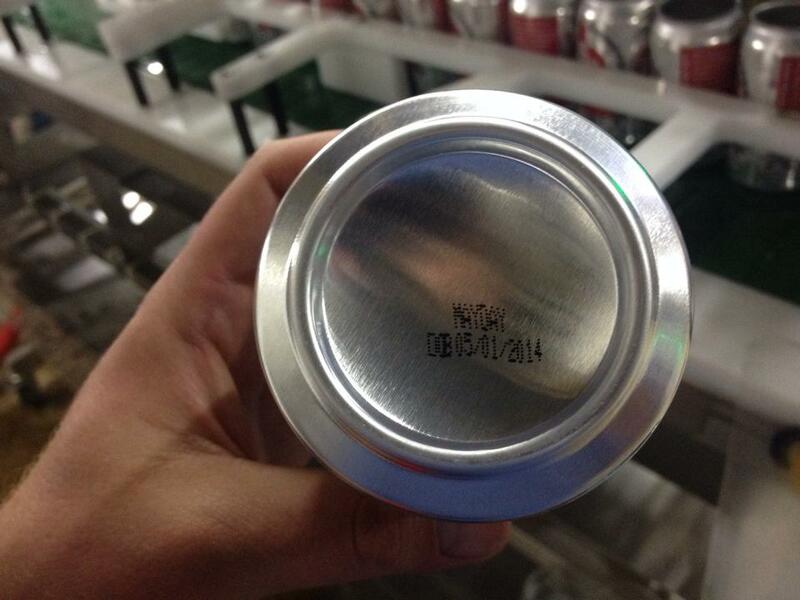 I returned to the brewery on May 1st, almost three weeks after the brew day, to fill 200 cases of cans with the Public brewed on April 14th, 2014. Here is where I get to state my personal opinion about the beer made (specifically this one) at DC Brau. 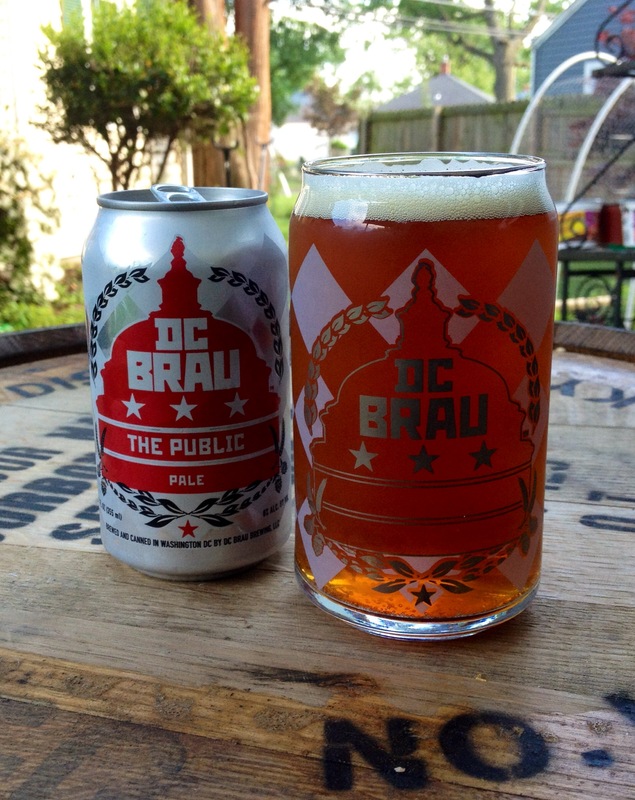 The public is DC’s “Boston Lager”….if you know what I mean. It is probably hoppier than a novice might expect for an American Pale Ale and more amber than most, but I like hops so I like that it is hoppier and the color is the color. The beer has no aftertaste, a sign that it was properly sparged. There is absolutely nothing wrong with the execution of the beer. 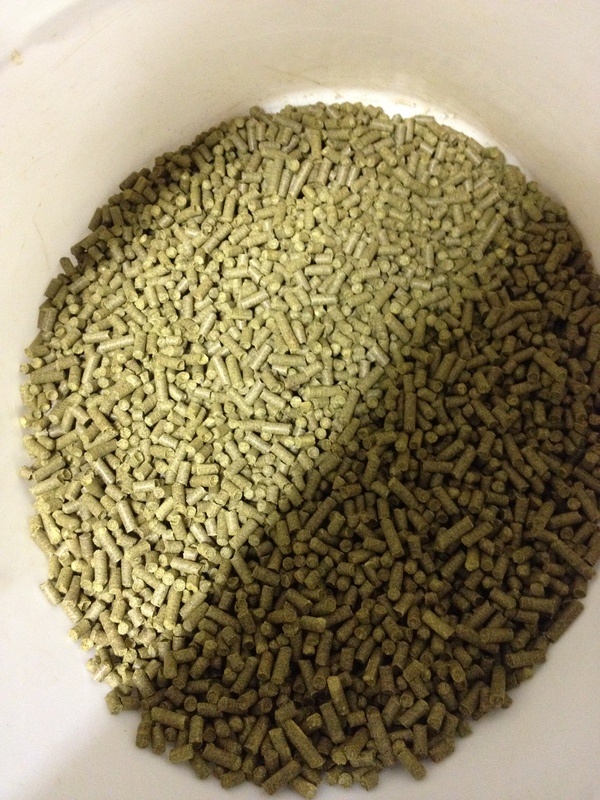 The hops pop, they fit in well with the malt backbone of the beer. The malt is a supporting actor to the hops and not the star (malt should never be a star in an American Pale or IPA). Carbonation is dead on, beer can be a little hazy at lower temperatures but that is pretty common with hoppier or dry hopped beers. It isn’t my favorite beer from DC Brau or my favorite American Pale ale…but it is solid and a great beer. I will have no problem drinking the case I have…and I will have it again in the future. Beer has a nice off white head of small and medium bubbles, decent retention, some lacing on the glass. Moderate carbonation, steady throughout the drink (no nucleation sites on the bottom of the glass….come on guys). Aroma is grapefruit and resin…mild malt sneaks through…no yeast in the nose at all (not surprising, this is made with a really neutral yeast). Beer is medium in body, moderately bitter with a nice fruitiness on the front / midpalate region. It doesn’t finish dry but with a small lingering hop bitterness at the end. No aftertaste, wet finish…refreshing. Easy drinking…almost a lawn mower beer…it is dad fuel. My overall impression of the brewing process at DC Brau was very professional. We spent nearly all of our down time (waiting for the kettle to boil or during the sparge), cleaning things or getting ready for the next step, taking gravity readings or pH readings. With multiple batches going simultaneously there was a lot to keep together. During the canning of the beer, the machine worked wonderfully — once you got it going. We blew through several cases of short fills (they were discarded) and a few shredded cans. We were weighing every can as it came out, waiting for the machine to get above the cut off weight for a full fill. Once the machine was humming along, it was incredibly easy to babysit, just make sure it never ran out of caps. I had great conversations about the beer industry and brewing with the brewer Chris. He pointed out innovations the brewery had undergone in the past few years. The whirlpool is a relatively new addition as well as the silo on the exterior of the building to their process and he was talking about obtaining additional equipment, specifically a dissolved oxygen meter. Budman told me how the new canning line (less than a year old) had increased the speed of canning and, he felt, the quality. It can be frustrating to get things going but once it was up and running we were canning almost 50 beers a minute. I hope you enjoyed following a batch of the DC Brau flagship “Public” through the brewery with me. I don’t want to focus on the distribution in this particular post (I will write about beer distribution) but in case you don’t know where to get DC Brau beer, they have a nice page that shows all the locations their beer is sold. At the time of this post, DC Brau is available in the District of Columbia (of course), Virginia, Maryland, New Jersey and they are moving into Pennsylvania. I predict more growth, more great hoppy beers, followed by more growth for DC Brau. As always, I’m looking forward to whatever they come up with next. Now, bring back Stone of Arboath and Stone of Arboath Abbey please …. and Yonder Cities … and Alpha Domina Mellis … I’ll stop now. I would like to thank the crew at DC Brau for letting me work with them, obviously Brandon and Jeff for letting me observe and participate in their brewery. Specifically I’d like to thank Chris and Budman, since I spent most of my time working with them. It was a blast, thank you so much. Going to do a smaller brewery / brew pub next. Stay tuned for that. Great breakdown and review, it’s always interesting to see the brewing process as basically a large up scaled and more technical version of the homebrew process with way cooler equipment. Thanks, glad you liked it. I’m hoping to do a brewpub, a nanobrewery, a farm brewery….hit all the levels and try to focus on what makes each one unique. There will be another one of these up shortly. I’ve been homebrewing for about a year. All grain. Batch sparge. Can you elaborate on your statement about lack of aftertaste being a sign of a proper sparge? If you over sparge, sparge at the wrong pH or at too high a temperature you can extract tannins and other off flavors out of the husks of the grain and that can give your beer a bad aftertaste. I sparge at a relatively low temperature and under-sparge to avoid this.